Ninth day of Christmas - moativation! On the ninth day of Christmas, I'm concentrating on gardens with "moats" - which means a ditch surrounding a property, generally filled with water "to deter besieging forces from access to the walls". And judging by the number of moated properties on the borders of East Sussex and Kent, there must have been many besieging forces in days gone by! 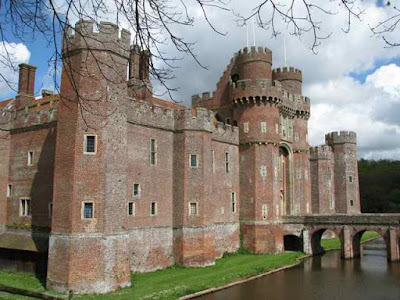 Herstmonceux Castle (above), with its observatory in East Sussex is one of the most impressive, dating from the 15th century and standing in more than 500 acres of parkland, but the garden is very much under development, so don't go here expecting to see manicured borders. 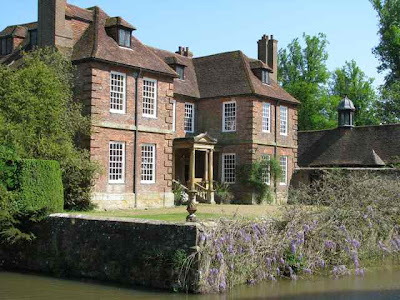 But it is an interesting property, offering wonderful walks in the surrounding parkland. Ightham Mote (pronounced "item moat") near Sevenoaks in Kent (above), takes its spelling of moat from "moot" or meeting place, rather than referring to the water surrounding it. Nestling in a valley, this house dates from the 1300's and is a splendid example of a 14th century manor house, with a timber framed upper storey. The last owner was an American - Henry Robinson from Maine - who acquired the property in 1953 and bequeathed it to the National Trust on his death in 1985. 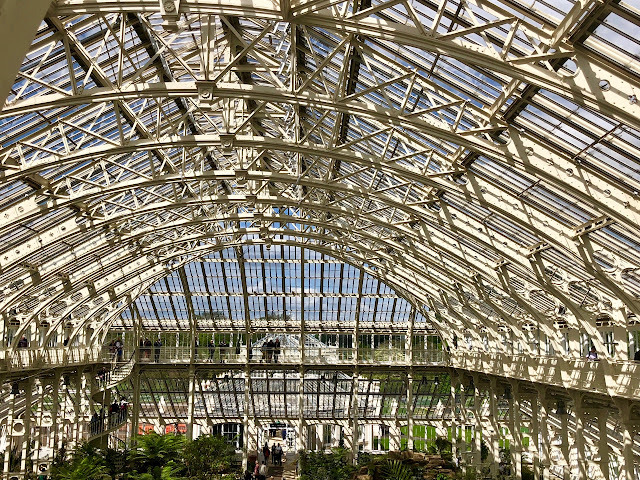 Noted for its amazing long borders featuring sweet williams and pinks, you will also see impressive displays of vegetables and herbs here, and magnificent rhododendrons. 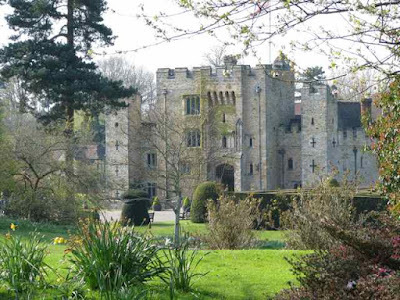 Best known perhaps is Hever Castle (above), which has a fantastic garden and was the former home of Henry VIII's second wife, Anne Boleyn, so is steeped in history. Bought by another American, Henry Waldorf-Astor, at the beginning of the 20th century, he restored the castle to its former glory and built a Tudor-style village in the grounds; made the great lake that stands there today; and created the magnificent gardens that draw visitors from all over the world. 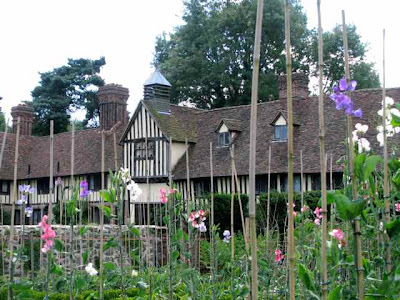 There is always a fantastic display at Hever, so you may want to allow more time here, to fully appreciate the beautifully-presented gardens. And while in search of moats, you shouldn't miss Groombridge Place (above) either - another splendid manor house surrounded by water and with terraced 17th century gardens that have been beautifully restored, and which feature the Drunken Garden of misshapen junipers, a giant chess set (below) and an enchanted forest for the children. 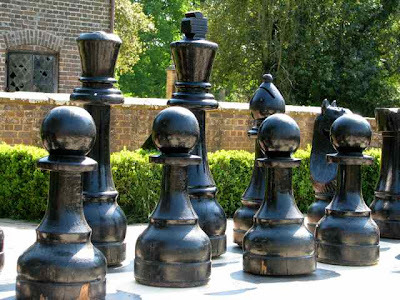 I'm crazy about giant chess sets! And moats are wondreful, they always make me think of fairy tales. Hever Castle - methinks I need to visit there one day! I love the notion that you can drive but a short distance and see real castles.... with moats and drawbridges, and giant chess sets. Lovely! Visited the new site yesterday..... how ever will you keep both running? When I was at Hever Castle 3 years ago they had a little "Museum" of period Dollhouses. Do they still have that? It was magnifiscent. 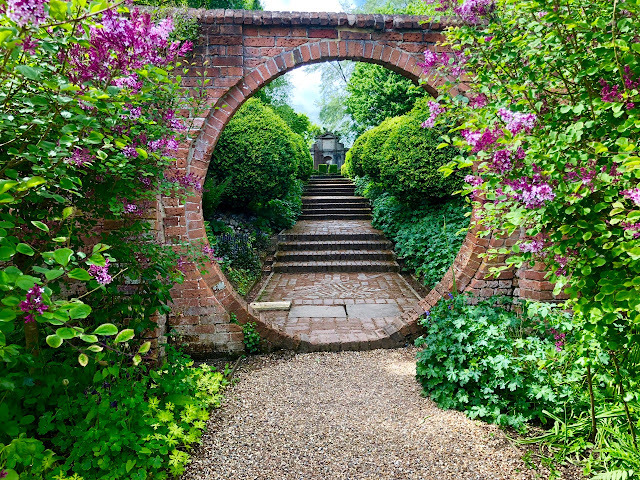 Oh if only my hubby was interested in gardens then we could have a great time around the UK touring places like this. I could see my boys trying to move those pieces and have a game of chess. Maybe I should just move to England. Can't decide which I like more, the chess set or your play on words! Either way, it's a great post. Thanks for sharing with us yet again. Congratulations on your new site. I signed up to follow. I look forward to new garden photos. I did enjoy seeing the moats around some of the castles we saw while in the UK. Hi Tiggerlot~~ Interesting as usual. As a west coast American, the idea of a 15th century anything is mind boggling. These places are amazing. Oh, too many terrible puns going through my head now, Charlotte, I don't know which one I like the moat. Love the concept of a Drunken Garden. Perhaps we can steal that idea to explain away any mishaps.